ecause it produced inadequate lift, the Wrights mostly flew their first glider as a kite at Kitty Hawk during October 1900. Sometimes loaded with 75 pounds of chains; sometimes with the elevator in the rear, they mostly flew it with wing warp immobilized, although Wilbur piloted it a few times (totaling about 2 minutes) to verify effectiveness of the wing warping. There are also statements in letters written by the brothers afterwards that the glider was flown with a tail (probably similar to the fixed tail on a Chanute glider), and that they flew it with the pilot (Wilbur) not just in the prone position, but also hanging beneath it like a Chanute or Lilienthal glider. 52 lbs (23.6 kg) weight. The glider originally had a tail with fixed horizontal and vertical surfaces, but this was eliminated sometime during the Wright's flying experiments. 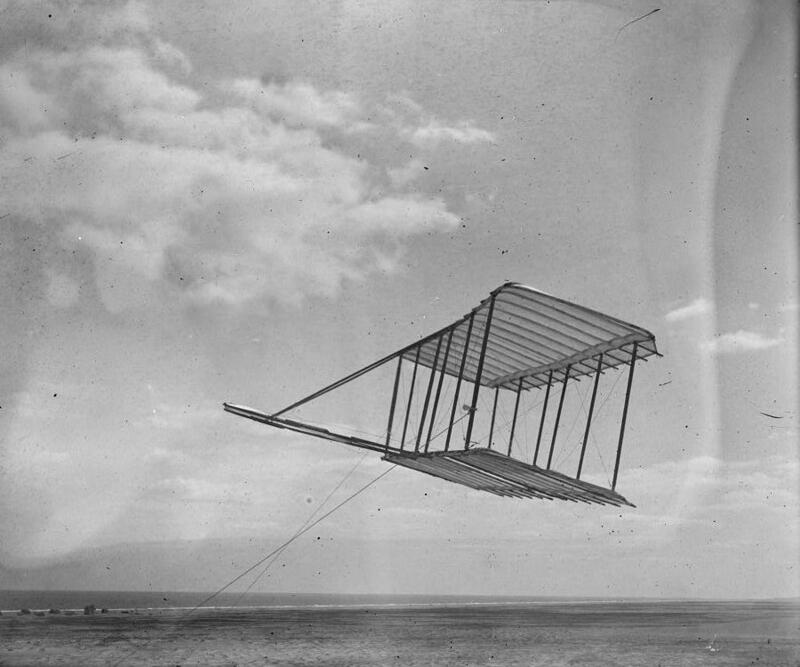 Despite its poor lift, the Wrights used three features of the 1900 glider on all their subsequent aircraft: biplane wings, wing warp for roll control, and the flexible elevator. They used the front elevator until the 1910 Model B, and the prone pilot position to reduce air resistance until the 1907 Model A. After the tests, the Wrights abandoned the glider at Kitty Hawk, NC. Tate family salvaged it; used wing covering for daughter's dress. See more images of the 1900 Wright Glider in our Virtual Hangar. 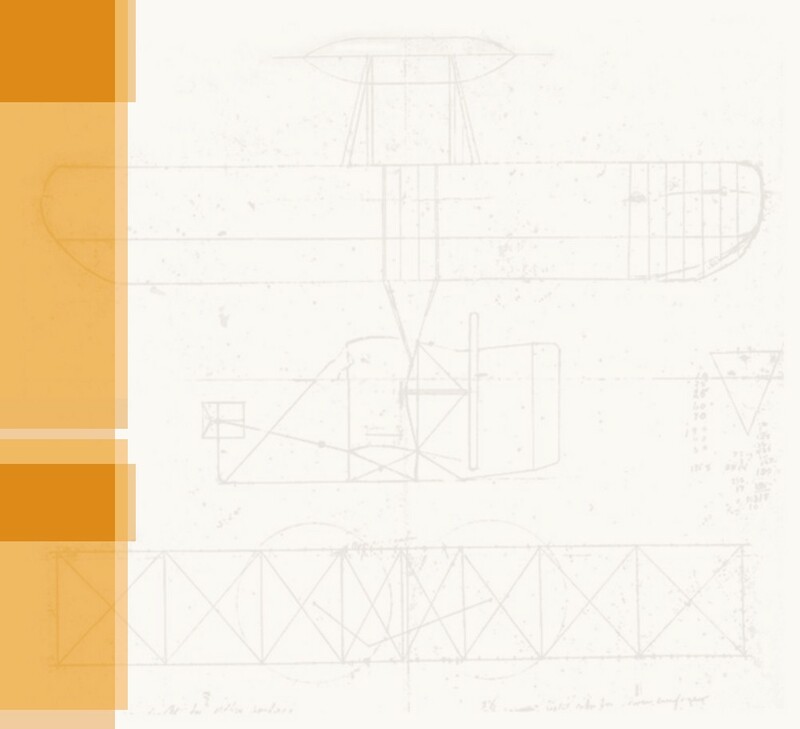 McFarland, Marvin W. (ed) The papers of Wilbur and Orville Wright. McGraw-Hill Book Co., New York, 1953, pp 1183-1184, & plate 14, 16, 17. Kelly, Fred C. The Wright Brothers, a Biography. Harcourt, Brace and Co., New York, 1943, pp 35, 49, 54. The 1900 Wright glider – Wilbur and Orville's first man-carrying airplane -- being flown as a kite. 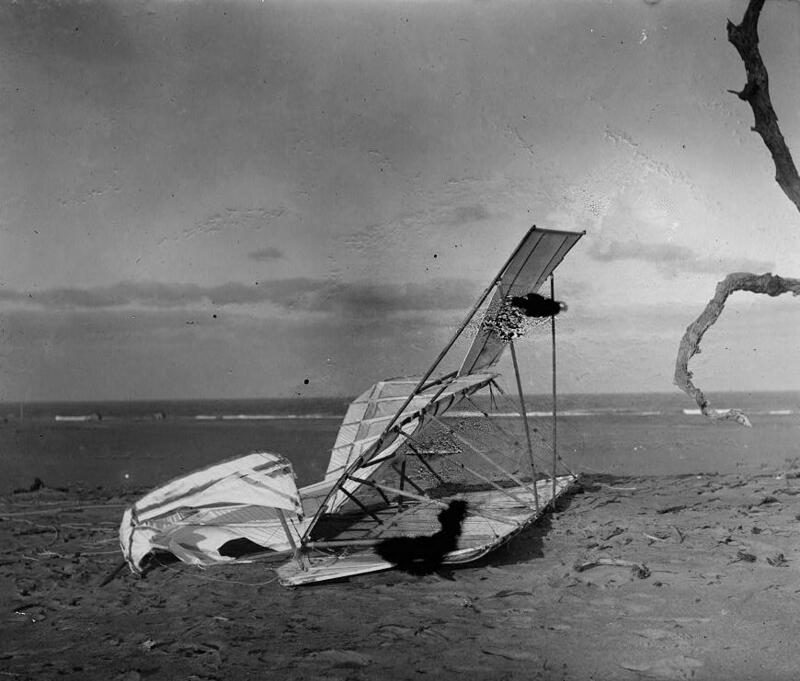 While the Wrights were testing their glider at Kitty Hawk, a gust of wind picked it up off the sand a nearly dashed it to pieces. 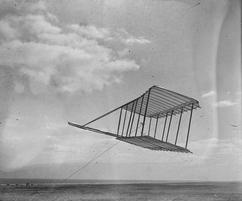 Surprisingly, the Wright brothers were able to repair the damage and had the glider flying again in a few days' time. 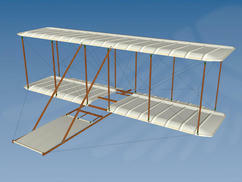 To explore the 1900 Wright glider in 3D, click the image above. Compare the original glider to the replica we made and flew on the centennial anniversary of the Wright's first gliding flights. 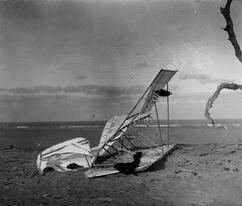 The Wrights took very few photos of their first manned aircraft at Kitty Hawk. 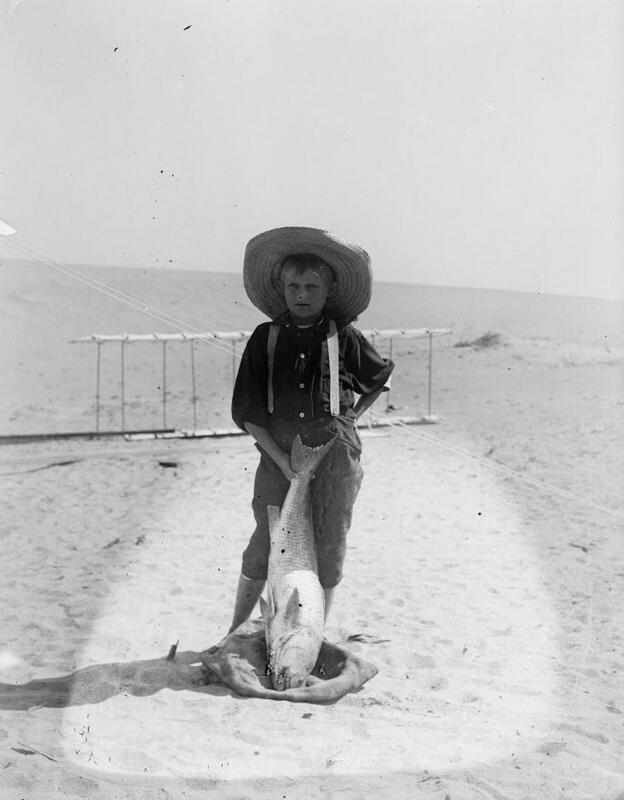 This image of a local boy, Tom Tate, showing the glider in the background is the only other photo of the original 1900 Wright glider.